Alan Goodwin "Dex" Poindexter (November 5, 1961 – July 1, 2012) was an American naval officer and a NASA astronaut. Poindexter was selected in the 1998 NASA Group (G17) and went into orbit aboard Space Shuttle missions STS-122, and STS-131. The crew of STS-131 pose in front of the Shuttle orbiter after the mission. Commander Poindexter first from the right side. 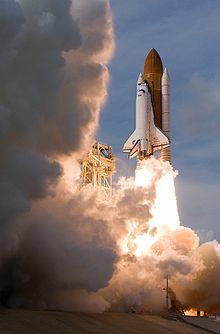 STS-122 begins its mission to deliver the Columbus laboratory to the International Space Station. Poindexter was born to John Poindexter and Linda Poindexter in Pasadena, California, and grew up in Rockville, Maryland, which he considered to be his hometown. He was married to Lisa A. Pfeiffer of Gulf Breeze, Florida. They had two children. His recreational interests included motorcycling, running, weight lifting, water skiing, boating, hunting and fishing. Poindexter attended high school at Coronado High School in Coronado, California, graduating in 1979. He received an associate degree in engineering from Pensacola Junior College in Pensacola, Florida in 1983, and then attended Georgia Institute of Technology, graduating with highest honors with a bachelor's degree of aerospace engineering in 1986. In 1995 he received a Master of Science degree in aeronautical engineering from the U.S. Naval Postgraduate School. Poindexter was commissioned in the United States Navy following graduation from the Georgia Institute of Technology in 1986. After a short period of service at the Hypervelocity Wind Tunnel Facility, Naval Surface Weapons Center, White Oak, Maryland, Poindexter reported for flight training in Pensacola, Florida. He was designated a Naval Aviator in 1988 and reported to Fighter Squadron 124 (VF-124), Naval Air Station Miramar, California, for transition to the F-14 Tomcat. Following his initial training, Poindexter was assigned to Fighter Squadron 211 (VF-211), also at Miramar, and made two deployments to the Persian Gulf during Operations Desert Storm and Southern Watch. During his second deployment in 1993, he was selected to attend the Naval Postgraduate School/U.S. Naval Test Pilot School Cooperative Program. Following graduation in December 1995, Poindexter was assigned as a test pilot and Project Officer at VX-23, the Naval Strike Aircraft Test Squadron (NSATS) at NAS Patuxent River, Maryland. While at NSATS, Poindexter was assigned as the lead test pilot for the F-14 Digital Flight Control System where he logged the first carrier landing and catapult launch of an F-14 with the upgraded flight controls. He also flew numerous high angle of attack/departure tests, weapons separation tests and carrier suitability trials. Following his tour at Patuxent River, Poindexter reported to Fighter Squadron 32 (VF-32) at NAS Oceana, Virginia, where he was serving as a department head when he was selected for astronaut training. Poindexter had more than 4,000 hours in over 30 aircraft types and logged over 450 carrier landings. Following his retirement from the NASA Astronaut Corps in 2010, Poindexter returned to serve in the U.S. Navy as Dean of Students and executive director of programs at the Naval Postgraduate School. Selected by NASA in June 1998, he reported for training in August 1998. Initially, Poindexter served in the Astronaut Office Shuttle Operations Branch performing duties as the lead support astronaut at Kennedy Space Center. 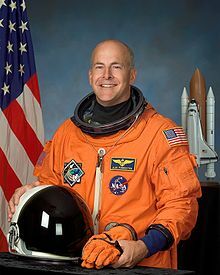 In December 2002, he was named as Pilot on STS-120 mission to deliver the Harmony connecting node to the International Space Station; an assignment which abruptly ended with the Space Shuttle Columbia disaster just two months later. In July 2006, Poindexter was assigned as Pilot on the STS-122 mission that delivered the European Space Agency's Columbus Laboratory to the International Space Station in February 2008. Poindexter served as a lead CAPCOM for the STS-125 mission to service the Hubble Space Telescope in May 2009, as well as the launch CAPCOM for the STS-127 mission in July 2009. He was the Commander of STS-131, which launched in April 2010. The mission's primary payload was the Multi-Purpose Logistics Module. On his retirement from NASA service in December 2010, Peggy Whitson, Chief of the Astronaut Office at NASA's Johnson Space Center in Houston said that: "Dex was a well-respected leader within our office, We will miss him being part of our team and wish him the best in his new role as he continues his service to the Navy and the country." STS-122 aboard Atlantis (February 7–20, 2008) was the 24th Space Shuttle mission to visit the International Space Station. Mission highlight was the delivery and installation of the European Space Agency's Columbus Laboratory. It took three spacewalks by crewmembers to prepare the Columbus Laboratory for its scientific work, and to replace an expended nitrogen tank on the Station's P-1 Truss. STS-122 was also a crew replacement mission, delivering Expedition 16 Flight Engineer, ESA Astronaut Léopold Eyharts, and returning home with Expedition 16 Flight Engineer, NASA Astronaut Daniel M. Tani. 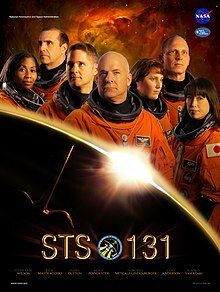 The STS-122 mission was accomplished in 12 days, 18 hours, 21 minutes and 40 seconds, and traveled 5,296,832 statute miles in 203 Earth orbits. STS-131 aboard Discovery (April 5–20, 2010), a resupply mission to the International Space Station (ISS), launched just before dawn from the Kennedy Space Center. Upon arrival at the station, Discovery's crew performed three spacewalks to replace an empty ammonia tank for the ISS Thermal Control System. They also transferred more than 13,000 pounds of hardware, supplies and equipment. Included in the transfer, were a new crew sleeping quarters, and three scientific experiment racks. On the return journey the MPLM (Leonardo Multi-Purpose Logistics Module) inside Discovery 's payload bay was packed with more than 6,000 pounds of hardware, and scientific and technical research return samples. The STS-131 mission lasted 15 days, 02 hours, 47 minutes, 10 seconds, and traveled 6,232,235 statute miles in 238 Earth orbits. After NASA he returned to the U.S. Navy. In the Navy, had the position of Dean of Students at the Naval Postgraduate School. On July 1, 2012, Poindexter died due to injuries he received from a water scooter accident in Little Sabine Bay in Pensacola Beach, Florida. Poindexter had stopped his water scooter while riding with his two sons and was hit by another water scooter. After being thrown in the water, he lost consciousness while being taken to shore. CPR was attempted, and he was airlifted to Baptist Hospital, where he passed away at age 50. NASA released a statement after he died, stating "The NASA family was sad to learn of the passing of our former friend, and colleague Alan Poindexter who was killed today during a jet ski accident in Florida. Our thoughts and hearts are with his family." Orbital ATK's July 2016 CRS1-5 mission Cygnus CRS OA-5's Cygnus space capsule was named S.S. Alan Poindexter in his honor. ^ "He reached the stars". Pensacola News Journal. Archived from the original on June 30, 2013. Retrieved June 19, 2008. ^ "Astronaut Alan Poindexter Leaves NASA". NASA. December 10, 2010. Archived from the original on December 15, 2010. Retrieved December 10, 2010. ^ "NASA Extends Sympathy to Poindexter Family on Death of Former Astronaut". NASA. Retrieved July 3, 2012.